Stranding are events in which one or more individuals of marine mammals reach the shore line, either living or dead, or are located in surrounding shallow waters, showing an inability to fend for themselves to return to deep water. Are those stranding circumstances that result in the confusion or loss of animals, events of depredation, diseases characteristic of the species or adverse environmental conditions. Are all those stranding circumstances attributable to human beings: harassment, fishing gear and techniques, spills, leaks, discharge of polluting substances or materials, explosions of infrastructure and other extraordinary events that cause disorientation and damage to the health of marine mammals. By number of animals involved: individual or collective (more than two individuals). By number of species involved: single-species (one single stranded species identified) or multi-species (more than two species identified). By the vital condition of the animals: alive, dead or mixed. By their physical condition: Alive in good health, alive with signs of disease, with injuries or trauma, dead without showing signs of decay, dead with first signs of decay, decaying animals, animals in advanced decay or animal remains. In Delphinus we have established these guidelines to guide the actions and measures to be implemented to respond to marine mammal stranding in the shore lines of Mexico, in such a way as to avoid affecting animal health and public health. In Mexico, the Federal Environmental Protection Agency, PROFEPA, is the coordinating body responsible for decision-making, the choice of methods, specialists or application of specific measures in the areas of marine mammal stranding. These guidelines are based on the “Protocol of response to marine mammal stranding” published in the Federal Official Gazette on June 17, 2014. Listed below are the previous actions, immediate response and follow-up to situations of marine mammal stranding. Any person who is faced with a situation of stranding must report it immediately to PROFEPA to the telephone 01-800-PROFEPA (770 3372), or in person at the corresponding State office. It is also recommended to call 911, since they can contact PROFEPA. The person must provide as much information as possible, so that a first assessment of the magnitude of the event may be carried out: contact information, location of the stranding, time of sighting, weather conditions, number of stranded animals, size of the animal or animals, their health condition, description of the animal or tentative identification of the species. When stranding reports are initially submitted to other federal, state or municipal authorities, they must inform it immediately to the PROFEPA or its federal offices. With this information, PROFEPA may take the necessary steps: first aid, data collection, contact with specialists, laboratory studies, etc. In the event that stranded organisms are alive, PROFEPA shall indicate it so to the corresponding authorities (who will be part of the response team) for the reception and rehabilitation of the living organisms, provided that they have the facilities and resources needed: veterinary and ethological medical management, dissemination, training, evaluation, management and follow-up. In the event that organisms are dead, PROFEPA will determine the final disposal of waste generated or corpses. Listed below are a series of actions that will contribute to the aid and welfare of organisms facing stranding. Do not handle or move individuals. To help them in the best possible way, it is important to perform a medical evaluation to determine their health condition and veterinary requirements. In the event they are dead, the authority will conduct an inspection, will collect samples followed by the final disposition of the remains. Avoid forming groups around the individuals. Remove any objects that may hurt them. When conditions permit, keep animals comfortable and quiet. In the case of cetaceans (dolphins, whales and porpoises) and Sirenians (manatees) stranded, it is recommended that these remain on their belly, and dig holes around their fins so they may rest without having to bear their full weight. Cover the animals with a sheet or light cloth soaked in water, wetting it frequently. This has the purpose of keeping the skin of the animal cool and moist; it is not advisable to throw water directly. Avoid covering the blowhole (the hole through which they breathe) and the fins, since through them they dissipate their body heat. Protect them from wind and sunlight physically (with the light cloth) and not using creams or other substances. For those who are in direct contact with the animal, they must remain out of the reach of the tail and snout, to avoid blows and bites. Avoid loud noises, shouting, abrupt movements. Staying calm will contribute to the tranquility of the animal. 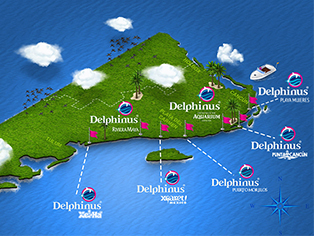 In Delphinus we care about the environment, for this reason we clean beachesand we encorage you to take actions for help any animal in danger, for a brillian blue planet!